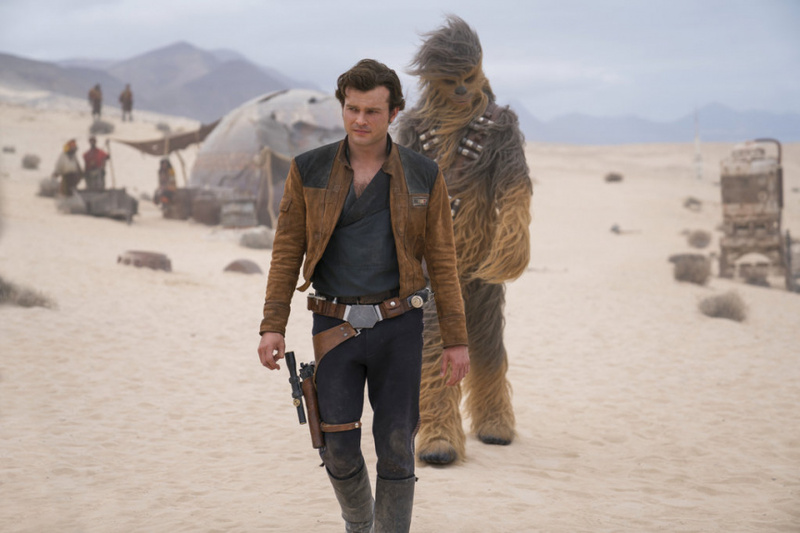 NEW YORK (AP) — "Solo: A Star Wars Story" easily topped the Memorial Day weekend box office charts with $103 million from its first four days in theaters, but the pricey and troubled production launch failed to meet the high expectations of industry analysts and the precedent set by the three most recent "Star Wars" films. "Solo" effectively kicked "Deadpool 2" to second place in its second weekend in theaters, with $53.8 million, while "Avengers: Infinity War" landed in third place in its fifth weekend with $22.4 million. "Book Club" took fourth place with $13.1 million, and the Melissa McCarthy comedy "Life of the Party" came in fifth with $6.9 million. 1. "Solo: A Star Wars Story," Disney, $103,016,812, 4,381 locations, $23,514 average, $103,016,812, 1 Week. 2. "Deadpool 2," 20th Century Fox, $53,830,329, 4,349 locations, $12,378 average, $218,537,681, 2 Weeks. 3. "Avengers: Infinity War," Disney, $22,454,542, 3,768 locations, $5,959 average, $627,649,180, 5 Weeks. 4. "Book Club," Paramount, $13,121,160, 2,810 locations, $4,669 average, $35,329,170, 2 Weeks. 5. "Life Of The Party," Warner Bros., $6,875,753, 2,937 locations, $2,341 average, $40,860,739, 3 Weeks. 6. "Breaking In," Universal, $5,500,695, 1,985 locations, $2,771 average, $37,089,350, 3 Weeks. 7. "Show Dogs," Open Road, $4,330,350, 3,212 locations, $1,348 average, $11,925,075, 2 Weeks. 8. "Overboard," Lionsgate, $4,138,397, 1,196 locations, $3,460 average, $42,632,810, 4 Weeks. 9. "A Quiet Place," Paramount, $3,132,531, 1,524 locations, $2,055 average, $180,830,910, 8 Weeks. 10. "RBG," Magnolia Pictures, $1,726,140, 416 locations, $4,149 average, $6,242,778, 4 Weeks. 11. "Rampage," Warner Bros., $1,097,390, 688 locations, $1,595 average, $94,192,405, 7 Weeks. 12. "Super Troopers 2," 20th Century Fox, $653,973, 221 locations, $2,959 average, $29,954,048, 6 Weeks. 13. "I Feel Pretty," STX Entertainment, $651,320, 551 locations, $1,182 average, $47,818,453, 6 Weeks. 14. "Black Panther," Disney, $608,991, 440 locations, $1,384 average, $698,745,233, 15 Weeks. 15. "Disobedience," Bleecker Street, $543,114, 224 locations, $2,425 average, $2,697,188, 5 Weeks. 16. "Pope Francis - A Man Of His Word," Focus Features, $444,310, 385 locations, $1,154 average, $1,249,775, 2 Weeks. 17. "Raazi," Zee Studios International, $439,982, 101 locations, $4,356 average, $2,481,992, 3 Weeks. 18. "First Reformed," A24, $373,439, 29 locations, $12,877 average, $516,401, 2 Weeks. 19. "Kasal," ABS-CBN, $329,153, 57 locations, $5,775 average, $329,153, 1 Week. 20. "Sherlock Gnomes," Paramount, $316,272, 298 locations, $1,061 average, $42,648,498, 10 Weeks.